T Riley Reiff vs. 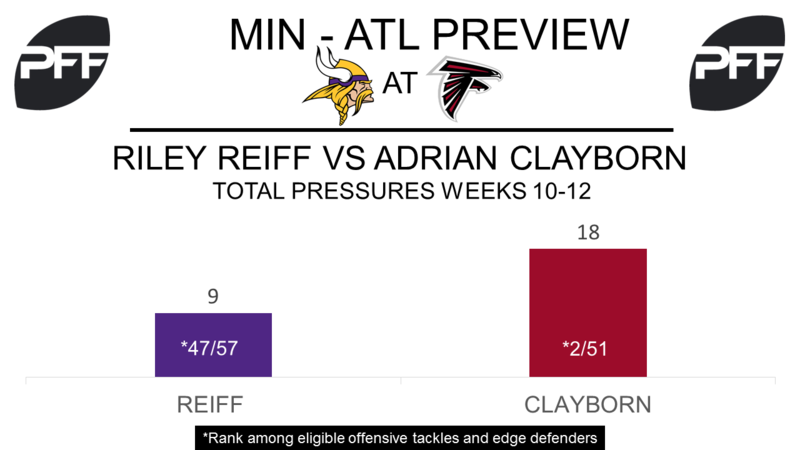 Edge Adrian Clayborn – Reiff has really struggled in his last three games. The offensive tackle has had game grades of 32.8, 50.8 and 36.1 between Weeks 10-12. He has surrendered nine total pressures in this time which is the seventh most and his pass-blocking efficiency of 93.6 is the 10th-lowest. During this same timeframe, edge defender Adrian Clayborn has been dominant rushing the passer. Clayborn’s 18 total pressures are the second-most by an edge defender, he hasn’t graded below 75.0 between those weeks and his Week 10 performance against the Dallas Cowboys earned Clayborn a 99.9 overall grade, the highest grade possible. WR Stefon Diggs vs. CB Desmond Trufant – Diggs has been deadly on deep passes this season as he has caught all nine of his catchable passes 20 or more yards downfield and his catch rate of 50 percent is third-highest. Diggs is one of nine receivers to be targeted at least 18 times not yet to drop a pass on deep pass. Trufant should make it difficult for Diggs as he has been one of the best corners in the NFL in 2017. Trufant’s overall grade of 88.3 ranks tenth among cornerbacks and he has been solid in coverage, ranking in the top 20 for coverage snaps per target (8.3) and coverage snaps per reception (15.3). RB Jerick McKinnon vs. LB Deion Jones – McKinnon could cause the Falcons some issues, especially in the passing game, where his receiving grade of 84.7 is the sixth best by a running back this season. McKinnon has forced nine missed tackles on his 36 receptions, which ranks ninth. Jones has posted a very good coverage grade this season of 88.1, which ranks fourth among linebackers and his four pass defenses are the third most. Despite this he has allowed three touchdowns in his coverage and his eight missed tackles in the passing game are the fourth most among linebackers. 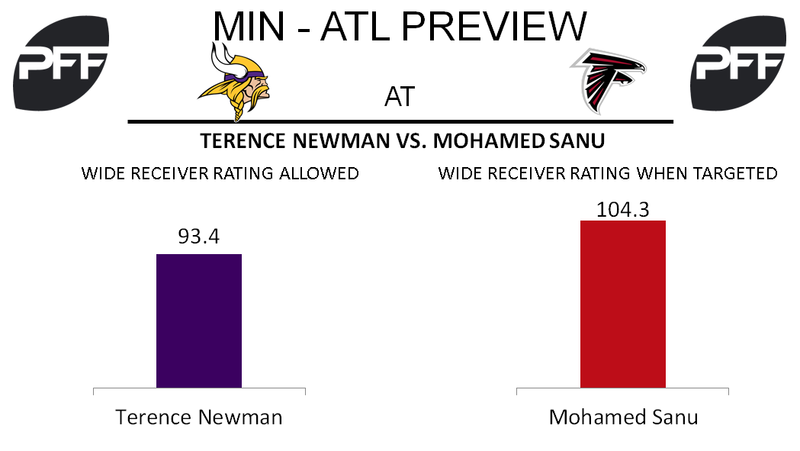 WR Mohamed Sanu vs. CB Terence Newman – This Sunday’s matchup between Falcon’s All-Pro wide receiver Julio Jones and Vikings cornerback Xavier Rhodes figures to be a closely contested matchup, meaning the Falcons will likely have to rely on other weapons to exploit advantages. Wide receiver Mohamed Sanu moves into the slot in three wide receiver sets and currently ranks third among qualified wide receivers in touchdowns from the slot with four scores. He has also generated the 14th-most yards from the slot with 323. The Vikings will counter with veteran cornerback Terence Newman, who is one of the longest-tenured players in the NFL. So far this season, Newman ranks 18th out of 52 qualifying cornerbacks in yards allowed per coverage snap when lined up in the slot with an average of 0.90 yards allowed. RB Devonta Freeman vs. LB Anthony Barr – Falcons running back Devonta Freeman sat out the past two games due to a concussion, but he is now on track to make his return this weekend. Fellow running back Tevin Coleman has filled in admirably over the past two games and will certainly still be involved, but the Falcons will welcome Freeman’s elusiveness back. Freeman ranks ninth among 51 qualifying running backs in elusive rating at 61.9. The Vikings will use linebacker Anthony Barr to help slow down Freeman. Barr has bounced back nicely after a down year in 2016, as he currently ranks 10th among 87 qualified linebackers in overall grade with a grade of 84.1. T Jake Matthews vs. Edge Everson Griffen – Edge defender Everson Griffen is putting together another fantastic season for the Vikings. Griffen has appeared in 10 games this season and has registered 12 sacks, which has contributed to his pass-rush productivity rating of 10.8. Griffen spends the majority of his time going up against opposing left tackles, meaning he will be mostly lined up against Falcons left tackle Jake Matthews. He has been a solid contributor for the Falcons, and he is currently ranked 16th out of 80 offensive tackles in overall grade with a grade of 79.0.